Every summer, when zucchini are in season, I make this pickle, which was adapted from Judy Rogers' brilliant Zuni Cafe Cookbook. It's my favourite pickle to put in a hamburger or eat alongside a platter of cold cuts. These pickles keep well in the fridge for a few weeks. 1. Slice the zucchini and golden shallots on a mandolin into two-millimetre slices. Toss the sliced zucchini and shallots together with the salt and leave in a colander to drain for an hour. 2. Meanwhile bring the pickle solution ingredients to simmer in a large non-reactive saucepan. When the sugar has dissolved, remove from the heat and leave to cool to room temperature. 3. After an hour, rinse the zucchini and shallots of excess salt and pat dry. Transfer the salted zucchini and shallots to sterilised preserving jars. 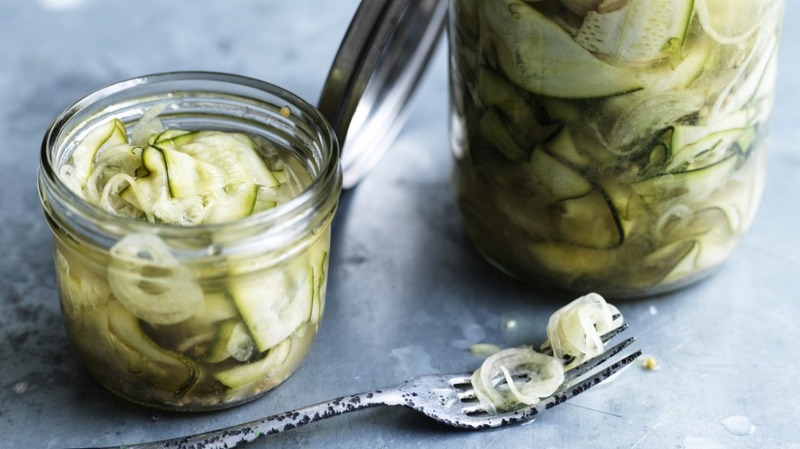 Pour the cool pickle solution over the sliced vegetables. Refrigerate overnight before using.